The U.S. labor market recovery from the Great Recession of 2007–09 has been uneven in a number of ways, including by location. While the nation’s overall unemployment rate may be below 5 percent, the health of local labor markets varies quite a bit. Previous recessions would tell us, however, that employment rates (the share of workers with a job) between states should have converged by now. Following the recession in the early 1990s, it only took four years to close the worker gap between states. But at the end of 2015—more than six years after the Great Recession ended—there were still 2.2 million fewer workers employed in states that were strongly affected by the recession compared to states that had relatively mild recessions. So why is it taking longer for the worker gap to close this time around? A new paper by University of California, Berkeley economist Danny Yagan shows that living in an area that was particularly hard hit by the recession can depress a worker’s chance at future employment. Using data on 2 million employees of the same retail chain, Yagan finds that workers living in an area that experienced a particularly strong economic contraction have an employment rate that’s 1.3 percent lower than comparable workers in areas that weren’t hit as hard. Now, this difference isn’t because more workers in those areas went on disability insurance, or because of a difference in skills between workers, or because these states had more workers lose jobs from layoffs. Workers did move away from these areas as previous work suggests, but employment rates didn’t converge. The answer may be due to the reasons for the shock to the local labor market. In the previous work that emphasized workers moving away as a way to mend the labor market, the focus was on the impact of manufacturing jobs lost due to declines in foreign demand. A worker moving away from such an area wouldn’t have an impact on the demand for goods produced in the local market. But the kind of shock that hit the labor market during the Great Recession—specifically the collapse of the housing market—had large impacts on local demand. 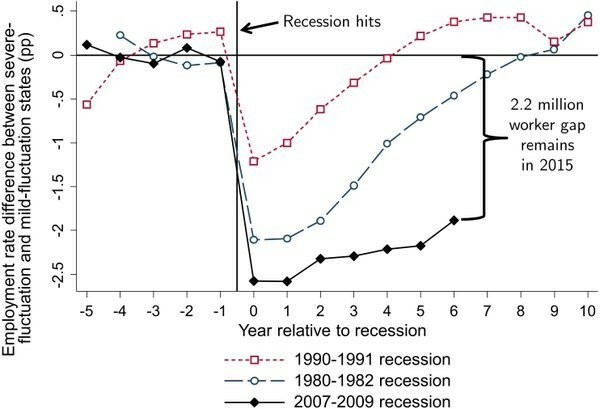 The shock had a much bigger effect on non-tradable sectors rather than tradable sectors, as economists Atif Mian and Amir Sufi emphasized in their work on household debt and the Great Recession. When a shock is more local, a worker moving away results in even less demand for goods and services created in the local labor market. Having a smaller labor force, instead of creating less competition for jobs, further reduces the demand for workers through lower consumer demand and doesn’t create the sort of equilibrating effect previous work might have expected. This means that there are significant “ negative externalities ” to people leaving these kinds of areas as it worsens the local labor market. And even workers who move away take a hit when it comes to their employment chances, though it’s not as severe as if they stuck around the area. The pace of convergence, according to Yagan, will be incredibly slow: At the current rate, employment rates between states disproportionately hit by the recession won’t converge until 2021 at the earliest. Of course, that assumes there are no bumps along the way. And the next time a shock hits the U.S. labor market, the dynamics Yagan highlights may be even more relevant. As the U.S. economy becomes more and more concentrated in the service sector, more and more shocks may create this kind of vicious cycle.